You’re on your way home from a long day at work. All you want to do is walk through the door, sit on the couch for a bit and eat a delicious dinner. You round the corner to the driveway, press the button on your garage door remote and- nothing. After a few more clicks the door still doesn’t move. After running through the rain to get into your house, you start searching for garage door repair in Beaverton. What can you do to fix or even prevent this situation? What can you do to prevent mechanical issues with your garage door opener? Taking the example from above, the problem might have been simply that the remote control’s batteries were expired. It always helps to keep a spare pack of batteries in your glove compartment, just in case. Most of the rest of what you might do to care for your door requires only three different products. These are lubricant, sealant and filler. Let’s take a look at each one. Your basic garage door works by having a motor turn a chain drive that pulls the door up over a track. If the chain, its sprockets, the rollers or the track are not properly lubricated, friction can slow down or even stop the opener from working. The key to preventing in this in the first place is applying lubricant. You want to use a silicone base, as it’s inert. It also doesn’t promote rust like a water-based lubricant might. Silicone lube stays in place for quite a while, giving you long-lasting friction reduction. The issue for which you use sealant isn’t directly tied to the performance of the garage door, but it does affect your home. The metal runners on either side create the edge of a barrier between the house and the garage door. Over time the runners can separate from the wall, leading to a gap in coverage. The gap in turn allows water to come in, and promotes mold growth. To prevent mold from taking over, or cold wind from lowering the internal temperature, apply sealant to any gaps. Your best bet is silicone sealant, as it’s flexible enough to expand and contract with the metal rails. Note that unlike other sealants, you can’t paint on silicone, so whatever color you choose is the one that you’re stuck with. Just place the tube of sealant into a standard caulking gun, making sure to cut off the tip and pierce the seal behind the nozzle. There’s usually a needle on your caulking gun for just this purpose. Occasionally you might notice cracks appearing in the door panels. If they’re made from non-wood material you can likely use Bondo or another industrial filler works nicely. When working with wood, make sure to select a product that features cellulose fibers. That’s what makes up actual wood, and it allows the filler to work seamlessly fit naturally into the cracks. All you have to do is take a plastic paint scraper and smear a glob of paste onto it. Now run the scraper down the length of the crack, allowing the paste to fill in. Let the material dry, and take a smoother sanding paper to buff it down so that it’s flush with the rest of the panel. From here you can paint or stain the filler to match your existing panels. Metal panels often get exposed to the elements as the paint coating wears away. Nicks in the surface also leave the metal open to the air. This exposure to oxygen can lead to rust forming. Rust spreads until the panels are too weak to do their job. To combat rust you can be proactive, searching for any nicks and using automotive paint to cover them up. be sure to add a top coat if your paint has a different sheen than the paint on the door. If the rust already takes hold, you’ve got some more work on your hands. one popular solution is buffing off the rust with a sander, or using a wire brush to wear off the oxidized particles. Lastly, you can get rust-dissolving jellies. These chemical s bond with and coat the rust to keep it from spreading. no matter what, always repaint over the areas where you stripped the rust. it gives you a cleaner, more attractive appearance so your house has more curb appeal. painting also protects the material underneath from becoming affected by rust again. 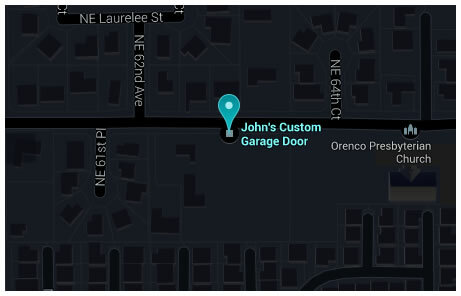 If you’re in the local area, you can turn to John’s for your custom garage door repairs in Beaverton. We’ve been in the community for generations, all the way back to 1948. In that time we’ve built up a lot of trust with our neighbors. Our team can repair all aspects of the door. whether it’s the motor, the receiver, the panels or something else, there’s nothing that we can’t do. We show up on time and work until the job is done. once we’re finished you’re left with a fully functioning door that looks and works as well as the day you bought it. Having a functioning, sound garage door is an essential part of keeping your home safe from intruders. When it comes time to take care of your garage door repairs in Beaverton, make sure to trust Johns. We’re very easy to work with and we make sure to treat you the same way that we’d want to be treated. It’s easy to get the ball rolling, just pick up the phone and give us a call, or use the contact form on this site to set up a free consultation where we walk you through all that your repairs entail. Our estimators tell you everything in plain English so you can understand what you need to know. Don’t your home’s well-being in just anyone’s hands, turn to Beaverton’s most respected shop for garage door repairs.